Boris Johnson, Mayor of London, has launched the first British built electric bus to go into operation in London. The bus is a fully electric powered Optare MetroCity EV and is one of four being operated by RATP Dev owned London United on the H98 between Hayes and Hounslow. The single deckers are currently being trialled on the route. Partly funded by the DfT’s Green Bus Fund, they are part of TfL’s continuing commitment to trialling new emission free technology in the capital. 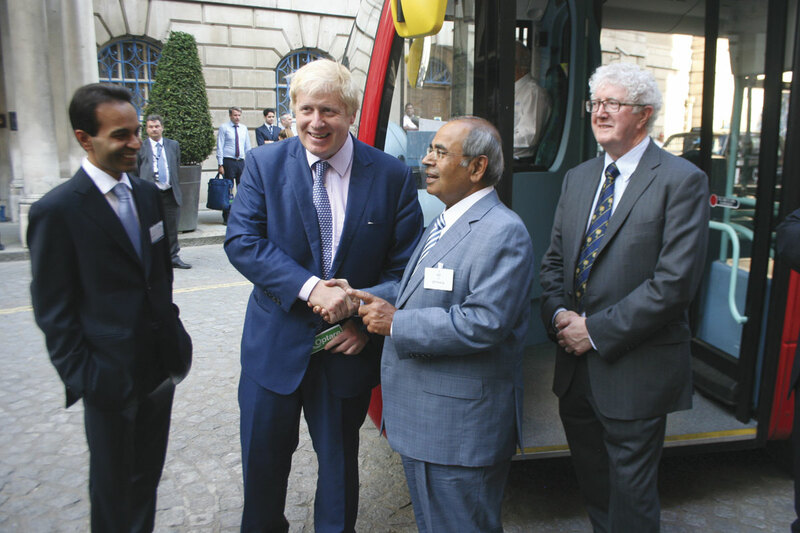 Rolling up to the event at The Mansion House on his push bike, Boris met Optare CEO, Enrico Vassallo and managers from Hinduja Group, Optare’s parent company, for a ceremonial handing over of the keys. The event was part of an air quality exhibition held at The Mansion House, with the Mayor being shown some zero emission taxis as well. The introduction of these four pure electric Optare MetroCity buses is the first step of the Mayor’s plan for all single deck buses in central London to be zero emission at tailpipe, as part of the world’s first Ultra Low Emission Zone, from 2020. Although these are the first British built electrics in the capital, the total number of electric buses now in service in London is six. The first two electric BYD e-buses in the capital entered service last December and are being operated on routes 507 and 521. A further two electrics are expected to take to the streets later this year, as London is engaged in a partnership funding bid with seven other cities in Europe to trial a range of pure electric and hybrid vehicle technologies and charging techniques. Electric powered Optares have been operated across the UK before, with examples in Nottingham and Manchester among them. According to Enrico Vassallo, they are starting to take off, gaining more popularity. However, he says the manufacturer still has to convince customers of the payback times of these vehicles, saying the initial cost compared to diesel equivalents is a significant concern among a lot of operators. He said Optare’s focus when it comes to green vehicles is on electrics, rather than hybrids. He described the latter as being a ‘bridge’ to electric power. Enrico said one of the main drivers behind the high cost of electrics is the battery. However, he said the battery industry is growing fast and he expects payback times will improve. If the cost of this technology becomes even more competitive, then in the near future he believes payback times could be as short as two years. He stressed that electrics are not suitable for all applications. For instance, he joked that a long distance service, such as one between London and Glasgow, would not be suitable for electrics. He said it is a solution most suited to city services, with start/stop operation. The trial of these latest electric buses will be used to establish whether the technology can stand up to the rigours of operating in an intense urban environment such as the capital. The tests will help TfL develop plans for greater use of electric buses in central London in the future, contributing to the Mayor’s vision of a central London Ultra Low Emission Zone. Optare’s own tests have demonstrated that while the initial capital cost of these vehicles was more than that of standard diesel, the significantly lower running and maintenance costs are expected to offset this within the typical lifetime of the vehicle. 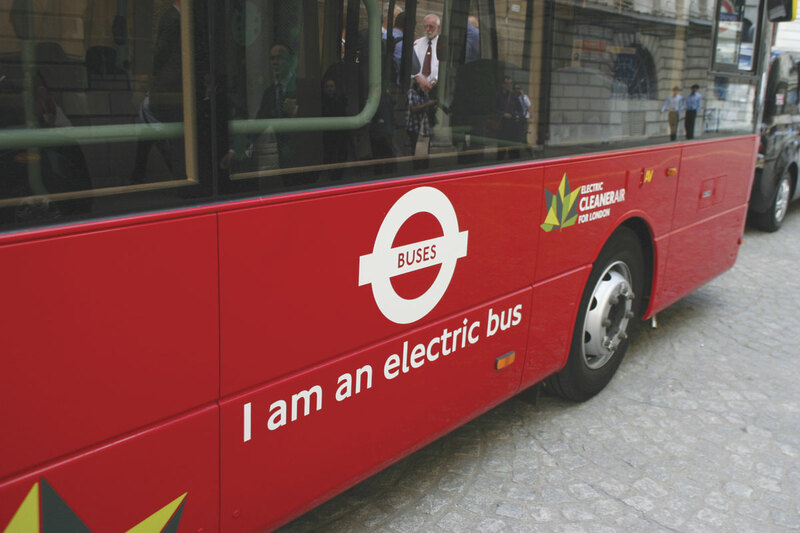 The electric bus trial is one of the many measures the Mayor has introduced to make London’s bus fleet more environmentally friendly, including the operation of zero emission hydrogen buses on Route RV1 between Covent Garden and Tower Gateway and delivering Europe’s largest hybrid bus fleet. Around 800 hybrid buses now operate on the capital’s roads, including the New Routemasters, with more being introduced in a rolling programme. By 2016 there are expected to be over 1,700 hybrid buses in service on London’s streets, representing 20% of the total bus fleet. TfL has also recently completed an extensive retrofit programme covering 1,000 older buses which involved fitting them with Selective Catalytic Reduction (SCR) equipment, reducing emissions of harmful oxides of nitrogen (NOx) by up to 88%.